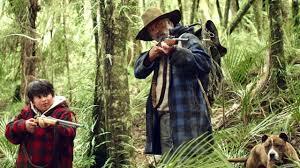 The highest grossing New Zealand film of all time ‘Hunt For The Wilderpeople’ (2016) is set for release in Australia on the 26 May 2016 in more than 75 theatres nationwide. 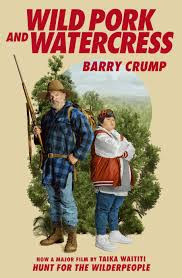 The film, directed by Taika Waititi of Boy fame, and starring Sam Neil (Hec Faulkner) and Julian Dennison (Ricky Morehu Baker) is based on Barry Crump’s (1935-1996) classic novel WILD PORK AND WATERCRESS. The novel was recently republished by Penguin for spin-off sales to coincide with the anticipated success of the film and includes 24 full page colour photographs of scenes from the film. Ricky is a 12 year-old disadvantaged city Mauri boy who commits a series of misdemeanours (stealing a packet of chips and caught riding a stolen bicycle) and is given “one last chance to straighten” himself out. He is offered to be fostered on a trial basis at his Uncle Hec and Aunty Bella’s farm on the East Cape of New Zealand. Uncle Hec is a tough, grouchy fifty-three old bushman who eventually warms to Ricky and teaches him how to hunt and survive in the bush. When Aunt Bella dies from a sudden stroke, social welfare plan to place Ricky in another foster home. They take to the bush and disappear in the dense Urewera region of the North Island, tramping and hunting and staying a few days at a time in the dozens of forester’s huts scattered in the remote, heavily mountain ridged area. The authorities wrongly surmise that Ricky has been abducted by his uncle and a search by forestry workers and police ensues. The rest of the novel follows the duo’s journey and their struggle for survival over the next nineteen months through a variety of humorous and sometimes tragic anecdotes. The writing is simple and sparkingly clear. Crump is at his best when he describes the rush of the hunt and its dangers and the triumphs or failures. In chapter 4 ‘A Tin of Peaches’ he describes a fascinating encounter with a fierce boar. The language has a spontaneous, immediate sense to it and we tremble in Ricky’s worn boots. “I was going to yell out to Uncle Hec when something came crashing down like a falling boulder through a ferny vine-filled gully and out through a stony place to the riverbed where it suddenly stopped, right under the bank I’d just slid down. It was a huge grey boar, like a big piece of elephant, with pricked-up hairy ears and dark sullen tufts for eyes. Its mouth was frothing and chomping on its big white tusks and its tail was slapping from side to side while it stood there. The story is told from 12-13 year-old Ricky’s point of view and he often directly addresses the reader to create a greater sense of intimacy with his audience. The last chapter ‘Epitaph’ is written by Robby Barton, a friend of Hec and Ricky’s, who has “found Ricky’s story”, amongst scattered papers and has decided to edit and publish it. The novel Wild Pork and Watercress is an enjoyable and highly engaging read. Crump is a smart and insightful writer who knows how to keep his reader entertained. 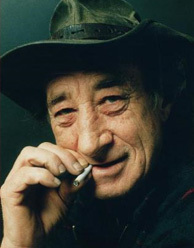 Although he has sold more than a million of his books in New Zealand, he has never been able to translate his sales overseas. It should be interesting how director Taika Waititi’s vision of Crump’s world 30 years on is accepted outside NZ and how it may evoke future sales of Crump’s bush tales.